Collaborations between theatre makers and scientists can lead to work that tackles diverse and complex subjects. Mouthful is an interesting example. 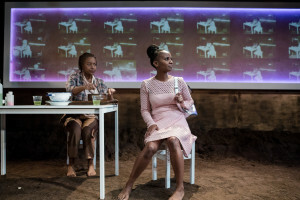 Developed by Metta Theatre and currently playing in an intimate space at Trafalgar Studios in London, the production comprises six short plays exploring different aspects of the global food crisis. Four actors play over 20 characters and the result in an absorbing, entertaining and surprisingly informative experience. Science Centre Stage spoke with the director of Mouthful, Poppy Burton-Morgan, about how Metta Theatre came to tackle the issue of global food sustainability on stage and how the playwrights and scientists worked together to create the six pieces. What’s is the background to Mouthful, what’s it about and what are you aiming to achieve with it? A few years ago in 2012 we commissioned six writers to write new short plays about the Arab Spring and wove the whole thing together into one play. Then in 2013 we were commissioned to develop a piece that was responding to political austerity – we used bread as a medium to explore that and how bread has been used in protest. Those are the conceptual seeds of doing something to explore the global food crisis through multiple voices. We’ve made quite a few pieces of what you might call science-theatre where we’ve collaborated with scientists in creating the work. So we took this one further in terms of commissioning six playwrights, each of whom were partnered up with a scientist, who all have different areas of research and specialisms relevant to the food crisis and food system and population ecology. Each of them went off in their pairs and created these six stories that we’ve then woven together into one play. They take us all over the world. There’s some organic carrot farming in Columbia. There’s a play about the Tunisian bread riots back in 2010. There are two that are set in strange dystopian futures. There’s one where there are no more potatoes and one where we’ve almost run out of water. Each of them took a different foodstuff and explored something to do with that. Each one either has a foodstuff or drink physically on stage. They’re very funny, but as you can imagine some of them are incredibly dramatic. Some of them are little bit heart breaking. The great thing is that a few of them are laugh out loud comedy as well. It’s got a bit of everything! Did you give the writers and scientists a free hand to see what they came up with or did you help enable the process, for example with workshops? 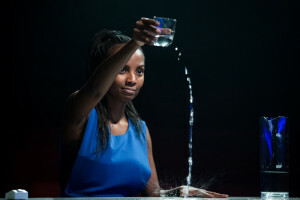 Alisha Bailey in 16 Pounds by Neil LaBute. The process was different for each partnership. Because it’s a completely international collaboration, the writers and the scientists between them cover four continents and a lot of countries. There was only one partnership where both the scientist and the writer were based in London. Actually for most of them it was about facilitating electronic introductions. Those relationships were really played out through email and Skype and occasionally phone calls and texts. We found in 2012 when we did the Arab Spring pieces (where we had international writers) that it’s actually amazing the way technology allows us to create a truly international project. We’re quite a small company, we don’t have the budget to fly everyone over, from Columbia, from America, from Finland. A lot of it has been done electronically. I’ve had quite a light touch in terms of the relationship between each partnership. For some of them I think it’s that the scientists would say ‘here is some research you could look into, here are some of my papers – does that provoke anything in terms of what you might write about, where you might go?’. And then I think for some of them it was a much involved, integrated process, and the writers sent them early drafts and some of the scientists would say – ‘actually, what you’ve written isn’t really possible or scientifically accurate and here are some papers that could take you in a different direction’. What’s really exciting is that some of them have really grappled with current research and current philosophical issues and ideas within science as well. But it feels like that bedrock has remained really accurate and at the heart of the plays. Between each of the six stories there are info-graphic interludes of video projection where various facts pertaining to either to the story that you’ve just seen or the story that you’re about to see come up in an animated info-graphic way. Without becoming didactic and like a public lecture, you hopefully leave it feeling that you have learned something about the global food crisis and all of the science around that but in a way that doesn’t mean the plays themselves have to shoehorn in those facts. That feels really successful. Did the writers deliver finished scripts or did the actors help devise some of it as well? No it’s all very much script-based. So the writers and scientists worked together in developing each of the pieces. Things have evolved a little bit in rehearsals. We had a four-week rehearsal process. But nothing major in terms of re-writes. They all sit quite firmly within a conventional play, albeit a short play. Is the global food crisis a particular topic you have had in mind to tackle for a while? I think we felt really strongly that when we did these Arab Spring pieces in 2012 that the short play format is such a great way of examining a global system where there is a multiplicity of voices, opinions and conflicts between certain parties’ versions of events. The majority of the work we make is quite politically or socially engaged but also done in quite a theatrically imaginative way. We were really interested in how we could explore something as global and epic as the global food crisis through theatre and through a series of shorter plays, short stories, to allow us to show different voices and different sides of the argument. All of the six pieces (actually seven – there’s a secret seventh piece which is a four minute musical about entomophagy – a whole other thing!) are linked thematically. But they speak about such different aspects of the system, coming from such different perspectives, that I think it gives people an insight in depth to those six issues, but it also makes you step back and go ‘these are six tiny pieces of an enormous puzzle’. 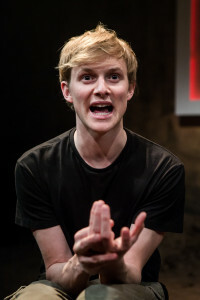 And the problem that we have to grapple with in the play and that we have to grapple with in reality is that that system is so inter-connected that you can’t solve it by saying ‘buy organic’ or ‘don’t eat meat’ or ‘do this’ or ‘do that’. There’s no one lovely catchall that would solve the system crisis. So hopefully the diversity of voices is a good way of demonstrating and exploring that. Did the Wellcome Trust help facilitate the links with the scientists or is that something that you pursued directly yourself? We went through that directly ourselves. Because we’ve done various science-theatre collaborations in the past we’re quite connected to the scientific community. The main scientific adviser is Professor Tim Benton who is the UK champion for global food security. Most of the other scientific collaborators were recommendations of colleagues or friends of his that he thought would be interested and provoked by the idea of an artistic collaboration. Which is lovely because they all have different areas of knowledge and they’re spread across the world – which feels like quite an exciting international thing. Did adviser Prof Tim Benton come to the rehearsal room to advise? We had several meetings with him early on before we’d even commissioned the writers in terms of how we would shape the project and the kind of scientists we would want to find to partner up with the writers and then he popped in and out of rehearsals. Once we had the scripts he read them all to check for accuracy and that theses are the right messages we want to be saying and are these the right provocations we want to be giving to audiences. We were really lucky in that one of our American scientists happened to be in the UK over the rehearsal period so she managed to pop by as well. For the others we filmed bits and used Skype so the cast could meet the international collaborators. We tried to keep it an open and welcoming project for everyone, even if they’re several thousand miles away that they still feel as involved as the writer who lives down the road and can just wander in. Given the international scale and electronic collaboration it’s possible that some of the writers and scientific advisers may not even have actually met in person yet at all? Absolutely. I think the majority of them haven’t. In some wonderful world where we transfer to the National Theatre or something and we have million of pounds (!) it would be such a wonderful thing to be able to fly everyone over and for everyone to meet in the flesh but everyone has to make to with virtual introductions at the moment. It would be lovely to tour the work to New York and show it to the American contingent of our collaborators, take it to Columbia, take it to Finland. So watch this space! There’s no one lovely catchall that would solve the system crisis. The success of Islington Youth Theatre’s Brainstorm (another science -inspired collaboration that transferred to the National Theatre) perhaps indicates a current taste for this type of work? I think there’s an appetite for it. There’s a real vogue for science-theatre that is exploring scientific ideas, scientific methodology. People don’t want to come and see a public lecture. They want their theatre to still be theatrical. Hopefully what we do well is marry that integrity of scientific content with an imaginative theatricality and performance style. 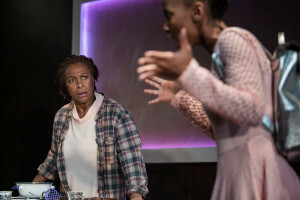 There are four actors who across the evening play 21 characters and all of them happen around the same dining table and stools so there’s a certain amount of imaginative leap that that the audience has to go on. Audiences want that, they want the thrill of theatre but they want the intellectual provocation of some really meaty ideas.